Reporters gave Clinton’s field operation too much credit before. Now it’s getting too much blame. 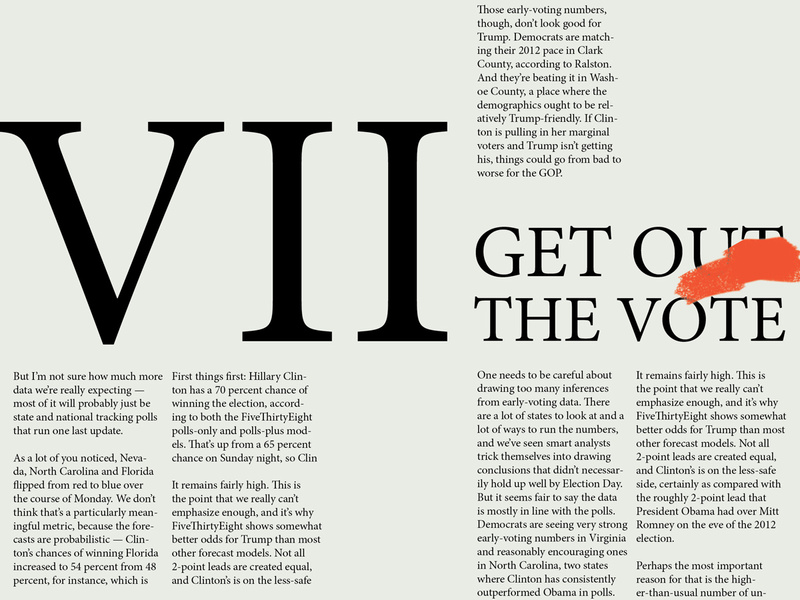 This is the seventh article in a series that reviews news coverage of the 2016 general election, explores how Donald Trump won and why his chances were underrated by the most of the American media. Mrs. Clinton’s efforts are most intense in a few large swing states where balloting is underway. Guided by data on millions of voters around the country, the Clinton campaign has deployed her top surrogates to areas where she needs a boost: Mr. Obama fired up voters on her behalf in Jacksonville, Fla., and Miami, cities where black voters have yet to turn out in sizable numbers. Seldom have Mr. Trump and Mrs. Clinton’s divergent approaches to electioneering been on more vivid display. Where Mrs. Clinton has homed in on minority turnout in early-voting states, Mr. Trump has delivered a broad-brush message denouncing Mrs. Clinton as corrupt. Seeking to break through on an electoral map that favors Mrs. Clinton, Mr. Trump has tested his strength in unconventional places — one day in tossup states, another in Democratic-leaning states like Michigan and New Mexico, still another in states that Mrs. Clinton seemed to have locked up long ago, like Virginia and Colorado. Mrs. Clinton’s extensive field operation gives her a big advantage over Mr. Trump, whose campaign employs a relatively meager staff and has outsourced most get-out-the-vote activities to the Republican National Committee. Needless to say, the election didn’t work out quite as Clinton hoped. Not only did she lose seven swing states and 100 electoral votes1 that Barack Obama had won four years earlier — she did so despite winning the popular vote. If the hallmark of a good campaign is turning out voters where you need them most, then Clinton’s failed miserably. She received almost as many votes (65.85 million) as Obama had nationwide (65.92 million). But while she earned 900,000 more votes than Obama in California and almost 600,000 more in Texas, she underperformed him in the swing states. So what went wrong with Clinton’s vaunted ground game? There are certainly some things to criticize. There’s been good reporting on how Clinton’s headquarters in Brooklyn ignored warning signs on the ground and rejected the advice of local operatives in states such as Michigan. And as I wrote in a previous installment of this series, Clinton did not allocate her time and resources between states in the way we would have recommended. In particular, she should have spent more time playing defense in states such as Wisconsin, Michigan and Colorado and less time trying to turn North Carolina into a blue state or salvage Iowa from turning red. Here’s the thing, though: The evidence suggests those decisions didn’t matter very much. In fact, Clinton’s ground game advantage over Trump may have been as large as the one Obama had over Mitt Romney in 2012. It just wasn’t enough to save the Electoral College for her. There are several major problems with the idea that Clinton’s Electoral College tactics cost her the election. For one thing, winning Wisconsin and Michigan — states that Clinton is rightly accused of ignoring — would not have sufficed to win her the Electoral College. She’d also have needed Pennsylvania, Florida or another state where she campaigned extensively. For another, Clinton spent almost twice as much money as Trump on her campaign in total. So even if she devoted a smaller share of her budget to a particular state or a particular activity, it may nonetheless have amounted to more resources overall (5 percent of a $969 million budget is more than 8 percent of a $531 million one). But most importantly, the changes in the vote from 2012 to 2016 are much better explained by demographics than by where the campaigns spent their time and money. Let me start with a couple of simple comparisons that I think pretty convincingly demonstrate this, and then we’ll attempt a more rigorous approach. Comparison No. 1: Clinton spent literally no time in Wisconsin, whereas Trump repeatedly campaigned in the state. Wisconsin turned red. But so did Pennsylvania, where both candidates campaigned extensively. Trump’s margin of victory in each state was almost identical, in fact — 0.8 percentage points in Wisconsin and 0.7 percentage points in Pennsylvania. That strongly implies that the demographic commonalities between Wisconsin and Pennsylvania — both of them have lots of white voters without college degrees — mattered a lot more than the difference in campaign tactics. Comparison No. 2: As I mentioned, Trump campaigned a lot more than Clinton in Wisconsin, and it turned red. But Trump also campaigned a lot more than Clinton in Colorado — it actually had the largest gap of any state in where the candidates spent their time. Colorado remained blue, however, with Clinton winning it by about the same margin that Obama won it by in 2012. The difference is that Colorado has relatively few white voters without college degrees, while Wisconsin has lots of them. Again, that strongly implies that demographics rather than campaign tactics drove the shift in the results. Another, more rigorous way to address the question is by regression analysis. Accounting for where the candidates spent their resources makes almost no difference, it turns out, once you’ve controlled for one or two major demographic categories and the 2012 vote. For instance, we can run a regression analysis to project the 2016 result in each state4 where the input variables are the 2012 results, the share of voters in each state who are whites without college degrees, and — it doesn’t matter much in the swing states but in order to avoid a big outlier in Utah and Idaho5 — the Mormon population of each state. If Clinton had an inferior ground game to Obama, we’d expect the model to overestimate her performance in swing states and underestimate it in noncompetitive states. But that’s not what it shows — instead, it replicates the actual results quite well in swing states, red states and blue states alike. * Projected vote is based on a regression that accounts for the 2012 vote, the share of voters in each state who are whites without college degrees, and the share of residents in each state who are Mormon. In Pennsylvania, for instance, the share of white voters without college degrees is well above average6 so the model expects an above-average shift toward Trump. And that’s exactly what happened, of course: Trump won Pennsylvania by about 1 percentage point, right in line with the model’s expectations. Wisconsin? Clinton’s roughly 1-point loss there is actually a tick better than the 3-point loss the regression model projects. The model also projects Michigan, Minnesota and Florida to be photo finishes, as they were. It has Trump favored in New Hampshire, which has a lot of white voters without college degrees, so that may have been a state where Clinton’s ground game did save her. On the flip side, the regression correctly projects Clinton to roughly replicate Obama’s numbers in Colorado and Virginia, as she did — even though Trump spent much more time than she did in those states. With one or two exceptions, such as Hawaii,7 it also does a good job with red states and blue states — for instance, in capturing the big shift toward Trump in Maine and the one toward Clinton in Texas. Or it may have been a combination of both: The ground game may have helped both Obama and Clinton at the margin. But studies from political scientists find the effects of a superior turnout operation to be quite modest in presidential elections9 — usually overwhelmed by larger, macro-level factors. In 2012, for example, the condition of the economy probably mattered more than Obama’s turnout operation. And in 2016, all the news generated by Trump and the media circus surrounding him, plus major stories like the FBI’s investigation of Clinton, tended to drown out the candidates’ efforts at a piecemeal, coalition-building approach. You certainly can criticize Clinton for choosing an overall message that didn’t sell to white voters without college degrees. That’s a high-level strategic failure, however, rather than one of her field operation or her Electoral College tactics. 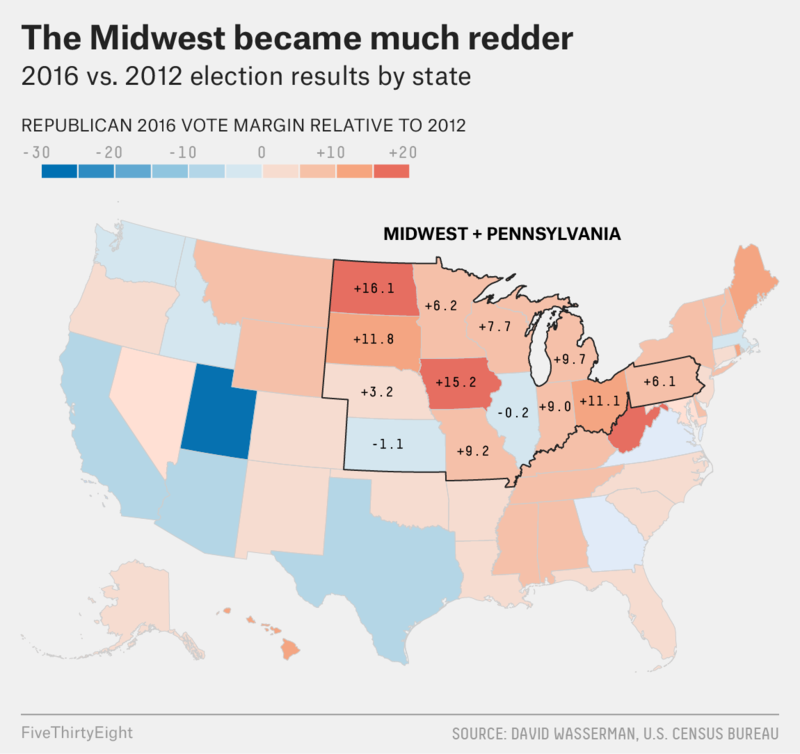 Not spending enough time in Wisconsin and Michigan was dumb, but probably wasn’t decisive. So did reporters go wrong in putting so much focus on the ground game? This series hasn’t been kind to how the media covered the horse race, but I’m somewhat forgiving on this question. Personally, I find a lot of this reporting to be valuable and interesting. I’d be something of a hypocrite otherwise, since FiveThirtyEight did a fair amount of reporting on the ground game ourselves. The error, instead, was in assuming that there was necessarily a lot of predictive information in the ground game. Toward the end of the campaign, the implication of much of the coverage of the race, especially when it came to factors such as early voting, was that Clinton didn’t need to worry about the tightening polls because her data and turnout operation would save her. That was probably a mistake because by late in the race, many effects of a campaign’s field operation are already reflected by the polls. If a Democratic canvasser successfully persuaded an undecided voter to move into the Clinton column, for instance, that voter would show up as a Clinton voter if a pollster called her. This is especially true for polls of likely voters, which can sometimes reflect the effects of a field operation by anticipating turnout patterns. There are also plausible ways in which a field operation’s effects might be missed by the polls, such as if a campaign registered a lot of new voters and a poll used an outdated registered voter list. But as an empirical observation, it’s hard to predict the direction of polling error. If anything, when the polls have been off in recent elections, it’s been in the opposite direction of what pundits and reporters expected. One reason I find it vexing when people are quick to blame the polls for underestimating Trump is that, at least during the stretch run of the campaign, most of the arguments were about why the polls might be overestimating Trump’s chances instead. Trump did make one visit to Minnesota late in the race. 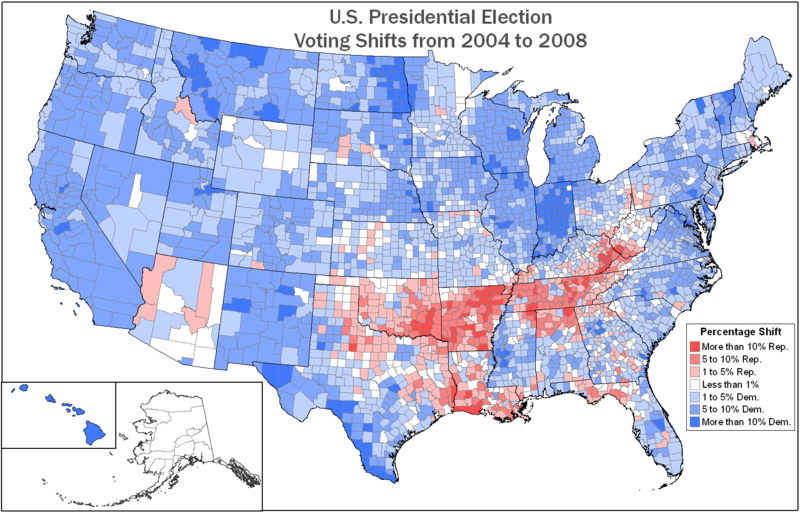 For a contrast, check out the map showing how the vote shifted from 2004 to 2008. Even on a county-level map, some of the state boundaries really pop out from their surroundings, such as those of Indiana and to a lesser extent, North Carolina, New Mexico and Virginia. Those look like effects from campaigning choices — that Obama campaigned extensively in Indiana while John McCain did not, for instance — rather than solely being the result of demographics. In the regression, states are weighted by their number of electoral votes. Mormon voters really did not like Trump after having a Mormon candidate in Romney on the ballot in 2012. Thus, Utah (68 percent Mormon) shifted more toward Democrats than any other state. Meanwhile, Clinton matched Obama’s performance in Idaho, which has a lot of white voters without college degrees but also a lot of Mormons. In Hawaii, native-son Obama was no longer on the ballot and the model overpredicts Clinton’s vote. The latter point is a subtle but important one. If Obama ran an A-plus field operation, then Clinton would have her work cut out for her just to keep pace with it. If Clinton’s ground game was a B-plus instead, she’d still experience some drop-off relative in swing states relative to the high bar Obama set in 2012. You can sometimes see effects like this — in the 2010 midterms, for instance, Democrats experienced an especially large drop-off in 2008 swing states because they didn’t have the advantage of Obama running his turnout machine. That isn’t what we see in this data for Clinton, however. She did worse than Obama in the swing states, but this is almost entirely explained by their larger share of noncollege white voters. More specifically, in general elections. The ground game potentially has a lot more impact in presidential primaries, and in other cases where overall turnout is lower.